Ketchikan is Alaska’s most Southeastern city and a popular first port of call for Alaskan cruise ships. It is the fifth-most populous city in the state and the local high school has an enrollment of approximately 600 students. In 2011, officials from the Ketchikan School Board needed to replace the 15-year-old roof on the high school. They turned to Trinity|ERD, an experienced building consultant and engineering firm in Seattle, WA, for a recommendation regarding the best roofing solution. With a moderate rainforest climate, Ketchikan averages hundreds of inches of rain per year and contends with strong winds. These were major factors when selecting a roofing system to protect the school. Trinity|ERD recommended the FiberTite 50 mil-XT product to meet the specifications created for the school. When sent out for bid, another contractor presented an alternative product that cost less, but did not meet the stringent specification. 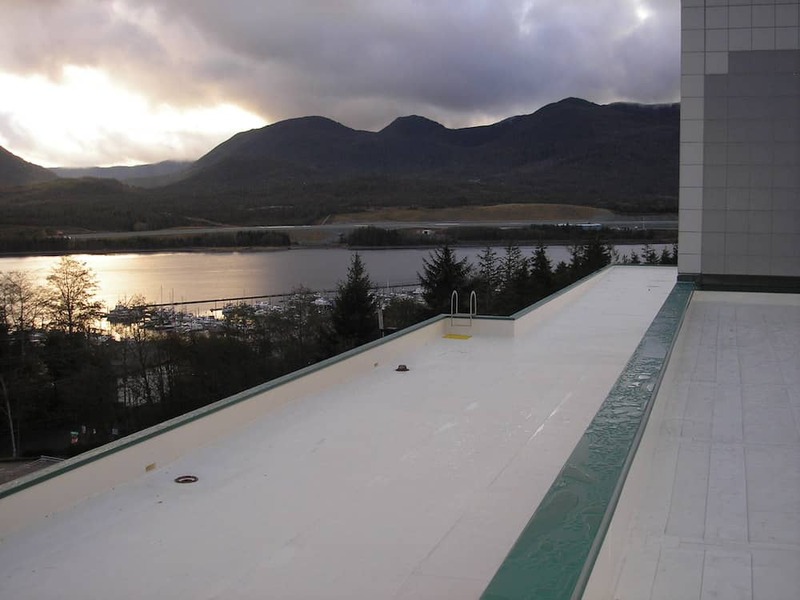 The Ketchikan School Board was confident that investing more additionally would pay off long-term because of the proven performance of the FiberTite Roofing System. E.P. Roofing from Anchorage, AK was contracted to install 108,000 sq. ft. of FiberTite on 22 sections of the high school. The installation took approximately four months as each section was tented during tear-off and installation to protect from the wind and rain. New edge metal was also installed for added protection. Subsequently the Ketchikan City Hall and the local Medical Center have also installed FiberTite Roofing Systems. Seaman Corporation has manufacturing locations in Wooster, Ohio and Bristol, Tennessee. In addition to FiberTite, Seaman Corporation manufactures fabrics for more specialized markets, including military, dock seals, marine applications, pool covers, truck tarps, mower covers and others.